Yessssssssss! Been eagerly waiting for them to fill in the gap between 16mm and 24mm (if you are shooting S35, or 14mm to 24mm which is an even worse gap if shooting “full frame“), as that gap was just too darn big! Rather annoying not having anything between those two lenses, so I’d been saying for a long a time Samyang/Rokinon needs to bring out a 20mm prime. Now I just need to save up the US$600ish the lens will cost. It is a little slower than the f-stop of the 24mm/35mm/50mm/85mm which are all f1.4, but that is ok as it is a 20mm lens and it is much harder to design fast wide angle lenses. Likely a 20mm f1.4 would’ve meant significant compromises with weight/size/quality/price. And the 20mm is already a little faster than the 16mm which is f2 (& much faster than the 14mm f2.8). 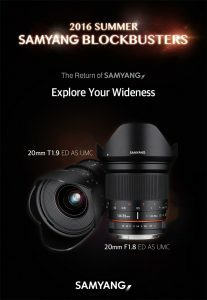 August 8th, 2016, Seoul, Korea – The global optics brand, Samyang Optics (http://www.samyanglensglobal.com) has today introduced new manual focus lenses for full frame DSLR cameras: 20mm F1.8 photo lens and 20mm T1.9 cine lens. As known for the brand’s wide and bright lenses, Samyang 20mm series adopted bright F1.8 aperture to provide perfect wide angle for interior shots and landscapes. The Samyang 20mm F1.8 ED AS UMC and 20mm T1.9 ED AS UMC are wide angle manual focus lenses for DSLR cameras with full frame sensor size. It has been a year that Samyang launched the full frame DSLR camera lens and latest lens was the 135mm series. Samyang Lenses are known for its bright apertures and so does this Samyang 20mm series. These two lenses have a bright aperture of F1.8, equivalent of T1.9 for cine lenses, to offer a best quality images under various lighting conditions. Also, the lightweight Samyang 20mm series brings the portability to increase the convenience. Based on Samyang Optics’ exceptional optical technology, 13 glasses in 12 groups are used to create the most optimal image quality. Among 13 glasses, there are 2 aspherical lenses and 3 extra-low dispersion lenses per lens to minimize aberration and unnecessary light dispersion, delivering high resolution from centre to corners of the image. This 20mm angle of view was designed to fulfill consumers’ requests to explore various occasions with Samyang Lens. In between ultra-wide 14mm and wide-standard 24mm, 20mm lens is a perfect fit to explore wide angles not only for shooting indoor images such as concerts and interior photos but also street snaps. The 0.2m of minimum focusing adds versatility to the lens. Specifically, the Samyang 20mm T1.9 is a cine lens optimally designed for professional follow focus system, thanks to the quiet and smooth de-clicked focus and aperture gear rings. Also, the distance scale and T numbers are marked on both sides of the lens for convenience when filming. 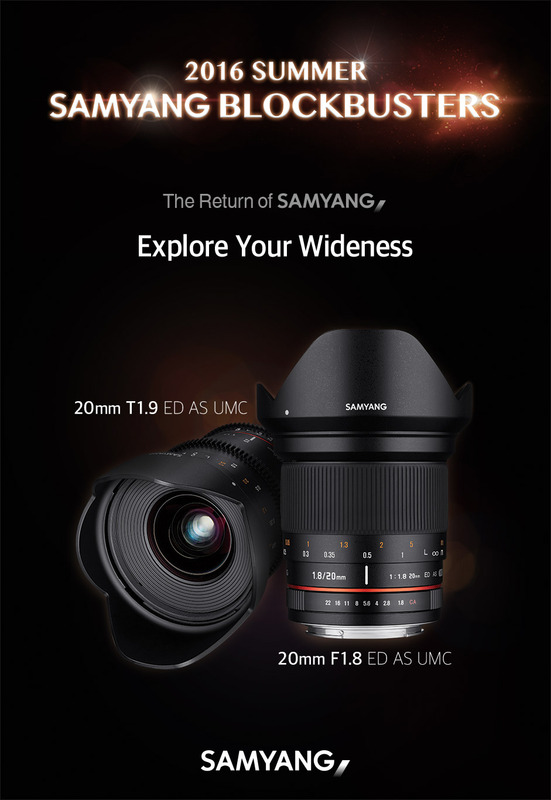 The best partners to explore your wideness, the Samyang 20mm series is globally available from September. The suggested retail prices are EUR 499 for 20mm F1.8 photo lens and EUR 549 for 20mm T1.9 cine lens. For more information, please visit Samyang Optics official website (http://www.samyanglensglobal.com), Facebook page (http://www.facebook.com/samyanglensglobal) and Instagram (http://www.instagram.com/samyanglensglobal). Previous PostSaramonic SR-VRM1, new XLR sound recorder coming soon!